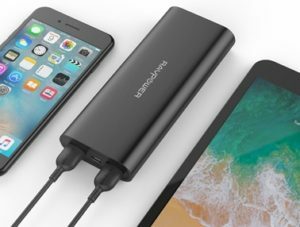 One of the top manufacturers in the portable chargers market is RAVPower and their product the RAVPower 16750mAh Portable Charger just completely backs them up. Founded by ex-Apple & ex-Google employees no wonder why RAVPower is a leading technology company specialising in products for smartphones and tablets. Not only do RAVPower offer top quality products they also aim to achieve customer service excellence by offering 24/7 customer support worldwide. Capable of charging an iPhone 6 or 6s almost 6 times, a Galaxy S6 almost 4 times or an iPad Air once. Total 4.5A output which is the highest output in the market. Able to charge 2 devices simultaneously. iSmart technology enables the power bank to charge devices faster and smarter, automatically detecting the optimal and most efficient charge for the connected devices. Safety protection feature triggers the battery pack to automatically shut down if short-circuit or over-current is detected. 4 LED lights allows you to check the remaining battery capacity of the power bank. Unique design featuring anti-scratch casing. Large battery capacity gives enough power for your devices for long journeys or even days away. High total output means the charging speed is a lot faster than the majority of other portable chargers on the market. The two USB ports has an output of 2.1A and 2.4A giving a total output of 4.5A. The 4 LED lights allows to monitor how much power is remaining in the power bank, this way you can check whether you need to recharge the power bank before taking it away with you rather than just guessing how much power is remaining. The RAVPower 16750mAh holds over 500 lifetime charging cycles which allows you to use it every day for a year and still have remaining charge cycles. Although the likelihood of someone needing to use it every day is quite slim so this power bank can last a good few years before A+ lithium-ion battery inside is depleted. Still a little bit big in size but as it’s relatively light the size is not a big issue. 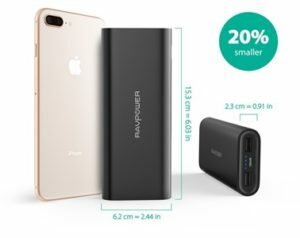 Although it’ll be ideal to have a portable charger with this much capacity to be half the size of your smartphone unfortunately the more power a portable charger holds the bigger it tends to be. 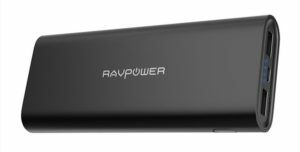 The RAVPower 16750mAh portable charger is roughly the same size as the iMuto Taurus X4 but it weighs noticeably less, so at least the RAVPower won’t feel like it’s weighing your pocket or bag down. The convenience of the portability and efficiency of the charging speed makes the RAVPower the ideal solution for when you need to use your smartphone and other devices the most.